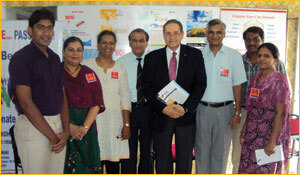 The Transplantation Society’s (TTS) President-Elect Francis L. Delmonico visited Hyderabad and Chennai, India on June 26-29, 2011 to meet with government officials and NGOs to further advance deceased organ donation programs in India. On June 27th in Hyderabad, the Multi Organ Harvesting Aid Network (MOHAN) Foundation, under the auspices of Lalitha Raghuram, convened an outstanding ceremony that was attended by Minister of Health D.L. 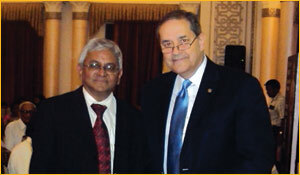 Ravindra Reddy and Dr. Sudheer Gupta, CMO, Central Government Health Services. The ceremony was the background for the unfolding of the Jeevandaan Program. The word “jeevandaan” means “gift of life”—the deceased organ donation program was developed with this idea in mind by Dr. Ravi Raju Tatapudi, who is the Director of Medical Education for the Government of Andhra Pradesh. Dr. Delmonico’s next stop was Chennai, where there is an exemplary program of deceased donation underway for Tamil Nadu, a state whose organ donor rate is 1.2 per million population which is 15 times the national average and with a great potential to grow. On June 28th, he had the occasion to meet the Chief Minister Jayalalithaa Jayaram who has assigned her staff to take the necessary next steps in accomplishing an expanded deceased donation in the region. As a representative of TTS, Dr. Delmonico was encouraged to witness the success of Tamil Nadu in bringing such accomplishment to the attention of the global transplantation community. “Once again the MOHAN Foundation has been instrumental with much congratulations to Sunil Shroff, Managing Trustee of the Mohan Foundation,” said Dr. Delmonico. He and Dr. Shroff met with P.W.C. Davidar, the Principal Secretary for the Government of Tamil Nadu, and together they set forth incremental steps to achieve a successful deceased donor program melding the mission of the private and public sectors. Mr. Davidar will address hospital administrators to permit certified transplant coordinators to visit the intensive care units and develop relationships with the professional staff, an important step that will help increase organ donation. The current reality is that organs obtained from private hospitals are distributed to public sector patients by a common waiting list that now exceeds more than 1,000 candidates for kidney transplantation. Approximately 6 donors a month are being realized, but those numbers can and will be much increased now that there is support from the government. TTS will continue to support the initiatives taken in India and will foster its relationships with Biocon and Panacea to maintain its presence in India with the overall goal of enhancing deceased organ donation.